When the Iron Man movies are an (at this point) unstoppable Hollywood juggernaut, how do you play out the anticipation for the upcoming Iron Man 3? Why by releasing a teser trailer of the first trailer due out this week. Yip a trailer for a trailer - how bout that? Firstly, so you get more of a complete meal then just a 13 second snack, and devour your veges first (as any decent caregiver will tell you), here's an Iron Man Jack-O-Lantern, by the same hands that made the Superman pumpkin, to satisfy your Iron-apppetite! so they are making an Iron Man 3. does Robert ever stop working? 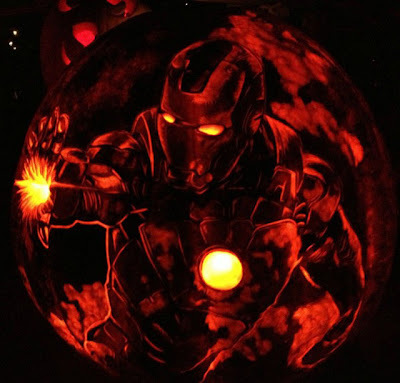 and that pumpkin carving is also pretty amazing just like the Superman one. thanks for the comment on the Rom blog it's funny you should bring up Mike Zeck i mention him in a similar context in an upcoming posting i've already written. rather it be iconic Marvel 80s artists or iconic 80s toy line we do indeed seem to be on a similar wavelength at times. While this trailer is super short, it's still got me eagerly awaiting IM3. I have a feeling that this is going to be better than IM2, if only because Ben Kingsley is such a damn good actor, he's going to really hold his in the movie opposite Downey Jr. Hell, he might even upstage him. And yeah, really is a sweet-looking IM carved pumpkin. There's a an equally awesome Wolverine one floating around on FB. Thanks guys! Yip Dale, there sure is, it's right on the IADW Facebook page. I have one more up my sleeve, but I might leave that for Halloween itself! RDJ seems to be consistently on the go Dave, and good for him too. I've dug the Avengers, Iron Man and Sherlock Home movies, so as long as he's up for it, so am I!